Join Us for Fun, Friendship & New Adventures! Girl Guides of Canada-Guides du Canada offers challenging, active programs for girls aged 5 to 18+. In the company of friends and women mentors, girls across Canada are experiencing the fun, friendship and adventure of the Girl Guide Movement. You can be a part of it! We are always accepting new Members. 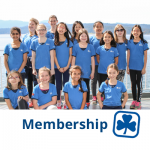 Registration Information – Call the Provincial Office at 1-800-565-8111 or Register through the Girl Guides of Canada National website’s Online Registration system. Are you looking for something fun to do in your free time? Do you like games in the outdoors? Would you like to go camping? Do you like singing fun songs around a campfire? Would you like to do something for your family, your community, your Province, Country or the World? If you answered YES to ANY of these questions, maybe you should find out more about Guiding and come join over 10 million other girls and women around the world who belong to this great movement. A place to have fun, learn new things and make new friends adventurous, activities-based programs where girls can challenge themselves in a safe environment an accepting and nurturing all-girl atmosphere opportunities to learn life skills and leadership abilities members can join any time of the year. access to training, activity ideas, program resources fun and friendship. Please note that Girl Guides of Canada is committed to providing a safe environment for every girl who joins our organization. Our Safe Guide document dictates appropriate ratios of adults to girl members in each Unit or group (based on girl age). This means that sometimes Units reach maximum capacity and it may not be possible to register your daughter/ward immediately in the group closest to your home or school.